When we refer to the menu bar, we’re referring to the container that wraps the top level menu items; not the submenu or any individual menu item. When Expand Menu Bar Full Width is activated (as it is by default), UberMenu will expand to 100% of its container element. The container element is defined by the theme. If the theme has defined the container element to be 50% of the inner width of the page, UberMenu will expand to 50% of the inner width of the page. If the theme has not defined a width in the containers surrounding UberMenu, it will expand to the edges of the viewport. Note that UberMenu cannot expand beyond the width of its container, so if the width of your menu bar seems limited, you should check the container defined by the theme. If you disable Expand Menu Bar Full Width, the menu bar will automatically size to the width of the top level menu items. That is, there won’t be any extra space on either side of the first and last menu items. It is important to realize that the maximum width of the mega menu submenus is restricted to the width of the menu bar. If your menu bar is too narrow, your submenu columns will automatically stack if there is not enough horizontal real estate to accommodate them. The position of the menu bar is dictated by the theme’s container. Under normal circumstances, UberMenu will appear in the same location as the standard theme menu. To change the position of the menu, a PHP edit, a CSS edit, or both may be required. If you activate UberMenu and the menu is no longer located where the original theme menu was located (for example, if the menu used to be below the logo but now it is above), it is likely that your theme’s header elements are positioned absolutely. There’s no way for UberMenu to predict this, and since elements are positioned relatively by default, UberMenu will float to the top of the absolutely positioned elements. There are three types of “centering” – be sure to pick which one you mean: the entire menu bar, the inner menu bar, or the menu items. If you want to center the menu bar, you can do so in the Control Panel. Sometimes this is necessary if when UberMenu replaces your theme menu it expands the full width of the window, and you mean to keep it within the bounds of your content area. Set the Menu Bar Width to the width of your content (or other desired width). 960px is a common width. 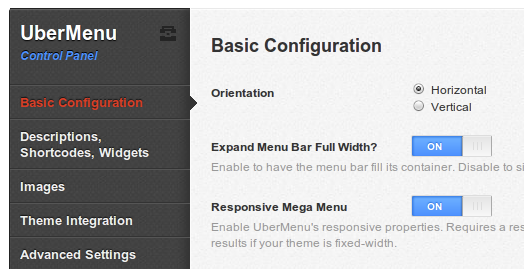 Don’t forget to disable the Expand Menu Bar Full Width option in Appearance > UberMenu > Basic Configuration. Your menu bar should now be centered. Sometimes, you want the menu bar to span the entire width of your window, but the menu items should be bound within the extents of the site content. Note that to have the menu bar expand the full width of the window, its parent element must be the full width of the window. The menu bar cannot be wider than its container element. Your inner menu bar should now be centered to your content. Remember that your submenus can only be as wide as your top level menu bar by default.